Dear readers, Štepalica is evolving as a blog and I hope I'm taking it in the right direction that will bring me some great opportunities, and that will provide you some interesting and useful information. Some time ago I was contacted by Serbian brunch of Elna, with a collaboration proposal. I have to admit I was rather excited about it and I couldn't wait for us to meet and discuss about possibilities of working together. So we thought of several ways we could join forces, but the most prominent one was having a column here on the blog, where I would write about different models of sewing machines they offer. The reviews would provide all the necessary information about numerous sewing machines that you minght find useful when buying one. The reviews will be sponsored, but their contents will be written by me and according to my experience while using each of the machines. In order to make my writing as accurate as possible I will sew several items with each model, I will use each machine for at least a month and I will give my recommendations based on the experience I get during this time. It will be especially interesting to me to try out the different models since I am used to working on an old machine that is almost my age, so I don't have much experience with sewing using more modern machines. 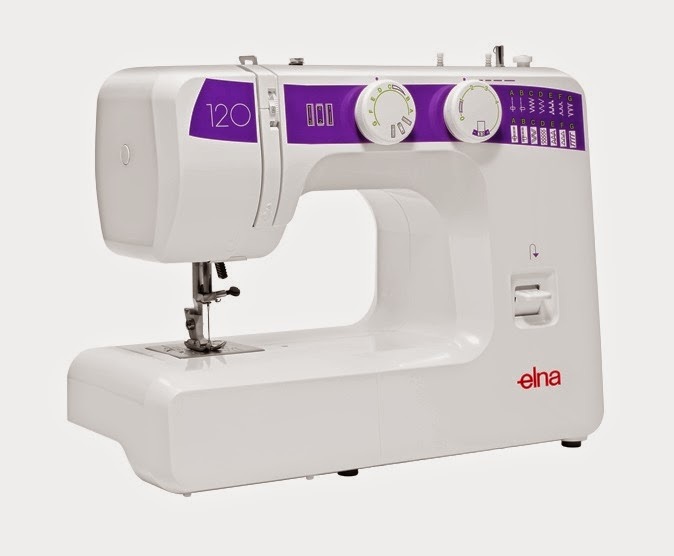 The first machine in a row is a basic sewing machine model Elna 120. What immediately intrigued me about this machine is that it's really light. I am used to the old full metal sewing machine, but it felt good being able to carry Elna 120 in one hand. This is especially conveninet when one doesn't have a sewing room and needs to frequently dismantle the machine and put it away after using it. I tested the machine during for a while, and made three shirts, two skirts, two dresses and curtains using it. I think I tested the machine thoroughly and I used all of the most commonly used operations. 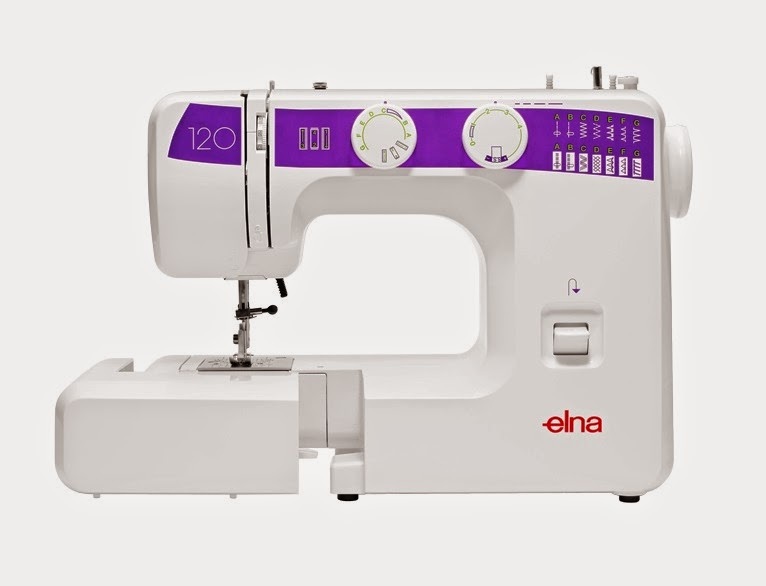 Elna 120 has a very compact case which stores a basic set of equipment: seam ripper, bobins, pressing feet for sewing buttonholes, invisible zipper, serging, and blind stitching, and there is also a special plate for free motion embroidery and sewing. Stiches and their withth and length is easilly regulated by rotating corresponding buttons in the desired direction. I have to add this machine comes with one needle only, and that's the thickest needle you can find, so I recommend buying a set of needles in all sizes. The needle can be set in two positions: central and left, which is great for determining the width of seam allowances or for easier access to the seamline. Also, the needle has two lifting positions for thinner and thicker fabrics. The machine supports sewing with two threads and a double needle, but this needle isn't included in the basic toolbox so you need to buy one additionally. The machine has only one mode of sewing when it comes to setting the speed. If you are a beginner, there's no need to worry about this, the machine has a normal speed of sewing and the pedal is rather touch sensitive so you'll regulate the speed quite easily. A great feature of this model is the sleeve arm that enables accessing a seam on narrow tubular items (like sleeves and legs). I haven't had a chance to try out the arm, but I can imagine how useful it would be when mending knee holes or attaching albow patches. Without the sleeve arm the sewing is so much more difficult and sometimes even impossible. Elna 120 is rather quiet (especially when compared to my old machine), which is great when working. The machine runs smoothly, the engine is rther strong and can pull heavy fabrics quite easily, which makes the machine perfect for sewing thick fabrics like denim. When I was making a twill skirt, the machine ran smoothly even when stitching over 6 layers of thick twill. What made me love this machine were the buttonholes. The sewing is done in 4 simple steps, using the special pressing foot, which enables making identical buttonholes with such an ease. Even if you make a mistake while making a buttonhole, it can be easily ripped of without destroying the fabric. I think I will miss Elna 120 mostly because of this feature. The buttonhole pressing foot has an adjustable slider that determines the buttonhole's length. While testing the machine I realized the slider cannot be fixed in a position, which made making the buttonholes with the same length quite difficult. However, with a minor imporvisation this problem is easily resolved, so I made a short tutorial that will demonstrate my point. Place a piece of toothpick behind the slider and fix it in place using ia piece of adhesive tape. The piece of wood will serve as a stopper and will fix the slider in place, thus making the buttonholes that all have the same lenght. The machine doesn't come with a suitcase, so I advise you to make a cover that you can make yourself. The machine is heavily oiled, which is great for maintaining it. but the oil might stain your thread and fabric. Therefore I reocmmend testing the machine using a white thread and a piece of cloth and keep stitching until the tread becomes snow white. The machine comes with detailed and illustrated user manual. All in all, I think thi model is a great chioce for beginners, as well as for those who need a quality basic sewing machine for home sewing.